A piece of artwork displayed at the United States Capitol depicting police officers as pigs is creating controversy from coast to coast, with police officers demanding it be removed. 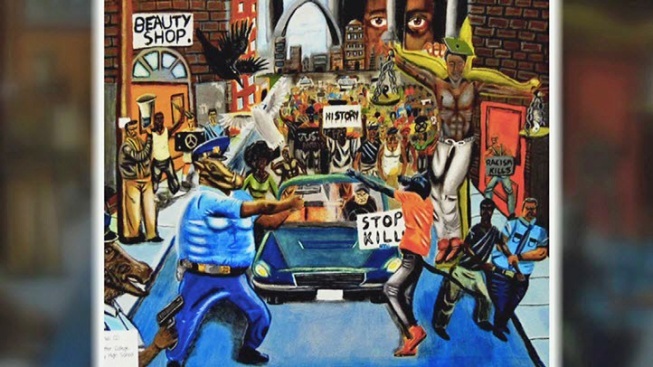 The painting, which was created in Missouri, has angered police in the Bay Area and across the nation. It shows police officers as pigs pointing guns at African Americans. NBC Bay Area obtained a letter that police in California sent to Republican House Speaker Paul Ryan, demanding he remove the painting immediately. "It's a hateful message," said Sgt. Paul Kelly with the San Jose Police Officers Association. The painting, which sits in the office of St. Louis Congressman William Lacy Clay, was one of the winners in a student art competition. Clay's office sponsored the art contest. Clay is African American. In a letter to Ryan, the San Jose police union joined with unions in Los Angeles, New York, San Francisco and Oakland in demanding tihe speaker use his power to take down the art immediately. "The broad brush of this artwork that says all police officers are racist against African Americans," Kelly said. "That's false and that does create violence." But in a response to NBC Bay Area, Clay said he had no role in selecting the winner. "The U.S. Capitol is a symbol of freedom, not censorship," Clay said. "The young artist chose his own subject and the painting will not be removed." Kelly said he supports free speech. But with all the deadly police ambushes last year, Kelly insists the artwork on Capitol Hill will only incite violence. "He has been serving in that position for 15 years," Kelly said of Clay. "He should have known better."